The 45BC-3 is a KEMAR Head & Torso with Mouth Simulator for Telephone Test, with externally polarized ear simulator and large straight pinnae. A special feature of this configuration is the 45EA Handset Postitioning System. 45BC-3 is delivered fully configured, individually calibrated and ready for use. In addition to a system calibration certificate, a USB flash memory with simulation data is included. The main configuration specific components of the 45BC-3 are the 44AA Mouth Simulator, the RA0045 Ear Simulator According to 60318-4, the KB1065/KB1066 Large Straight Pinnae and the 45EA Handset Positioning System. Read more about the RA0045 Ear Simulator. The KB0065 and KB0066 are large straight pinnae for use with a straight ear canal extension. The hardness is 35 Shore 00. They comply with the IEC and ITU-T recommendations. 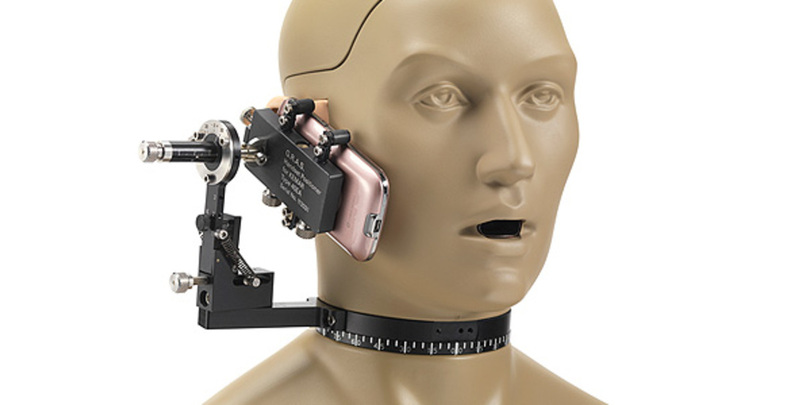 The 45EA Handset Positioning System is designed for the head and torso simulator with Mouth Simulator. With this combination, you can make very realistic in-situ measurements on mobile telephones as well as conventional handsets. You can mount the system on the KEMAR without additional tools. The system can be mounted on either side of KEMAR, and you can easily switch it from one side to the other side. Read more about the 45EA Handset Positioning System.